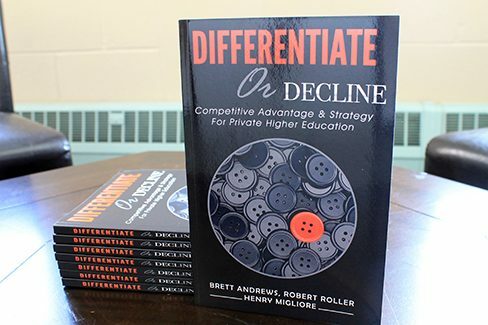 Dean Brett Andrews publishes book, "Differentiate or Decline"
Newman University School of Business Dean Brett Andrews, Ph.D., published his first book, “Differentiate or Decline,” at the beginning of June along with authors Robert H. Roller, Ph.D., and R. Henry Migliore, Ph.D. 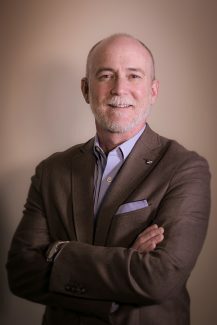 According to Amazon.com, “As an author, speaker, coach, executive, and consultant, (Andrews) has a passion for helping universities achieve growth and significance through the development of leadership, revenue sources, and campus strategy. 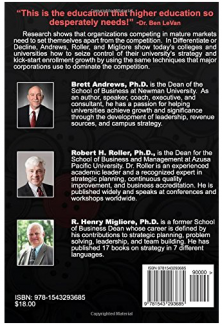 “Robert H. Roller, Ph.D., is the Dean for the School of Business and Management at Azusa Pacific University. Dr. Roller is an experienced academic leader and a recognized expert in strategic planning, continuous quality improvement, and business accreditation. He is published widely and speaks at conferences and workshops worldwide. Andrews recently sat for an interview to discuss the process of writing a first book, who was involved and why having a competitive advantage is key to offering a truly successful private higher education. Andrews: The book started out as a conversation about how we could help private universities with their positioning and their strategy. The idea of a book developed quickly. We began writing just about one year ago. Dr. Roller flew here to Wichita from his home in California and we spent several days writing the outline together. NU: How did you get involved in working with Dr. Roller and Dr. Migliore on this piece? Andrews: Dr. Migliore was the founding dean of the School of Business at Oral Roberts University. Dr. Roller and I are both graduates of that program — that’s how we met. Dr. Migliore has written 17 different books on the subject of strategy, so his coaching on putting this project together was essential. The original idea for the book was mine. I called each of them to discuss my vision for the project and the project grew from there. NU: What was the process like? Andrews: Each of us has strengths in different areas, so it seemed natural to assign the different chapters to the different writers. The challenge came during the editing process when we needed to knit the different writing styles together as if one person had written the entire piece. Once someone would finish a chapter, he would send it to the others for review and comment. That process yielded several good discussions about revisions, which made the final project that much better. NU: Who is the intended audience of your book? Andrews: The intended audiences are the presidents, vice presidents, deans, chairs, faculty members, and even board members of private colleges and universities. These are the leaders who are at the tip of the spear when it comes to keeping a private university relevant in today’s higher education marketplace. We want to empower them to be able to take control over their respective university’s position in the marketplace and be able to thrive, not simply survive. NU: Why do you feel it is important to discuss and educate people about these ideas? Andrews: The national headlines make my case for me. Papers and magazines continue to report about the national enrollment declines and reduced state aid that is choking the fiscal life out of many small universities. I want every private university to know that the market for higher education has irrevocably changed. Simply doing things the same way you’ve always done it won’t improve your university’s fortunes — it will only lead to inevitable decline. There is a bright spot, however. It is to fundamentally shift the way your campus competes against the competition. We outline a step-by-step process in the book that any university can follow that will allow them to take charge of their university strategy, begin to add power to the value proposition offered to prospective students and increase enrollment. All of the authors have implemented these techniques successfully at our own universities and we want to share this with other private universities. NU: Any initial thoughts after writing the book that you’d like to share? Andrews: We need to be able to meet the short-term needs of the students while they are on campus and the long-term needs of them in their career, and provide that pulling effect. But the way we are structured slows things down. What we boil this down to is that you have to have a competitive advantage. You have to be able to say, “Here is why we are different.” You have to be able to answer the question that a student will ask — “Why should I enroll here as opposed to the college right down the street?” That is the very first question we talk about in the book. If you can’t answer that question for your campus without saying, “We have a pretty campus, it’s small, here you are a name and not a number, we make wonderful leaders,” those are all great things, but I argue that those are things that keep people from leaving, not what brings people to the institution. And the reason is this: That is the same value proposition as every other small college in the United States. And so it becomes this vicious circle. (Dr. Roller) and I have built programs at multiple different universities or turned them around if they were failing, and what we talk about in this book is exactly how we did it. This is us recognizing that there is a unique and wonderful value in private higher education … we believe in it so much. But we know that we can help other colleges and universities do a lot better. NU: Any favorite topics of discussion included in the book? Here at Newman, we have this great competitive advantage in the sciences that we have been building for years, that’s been culminating in the Bishop Gerber Science Center that is being finished this semester — that is huge. And it shows with the number of students who show up and want to major in biology, chemistry, nursing, radiology technology, etc., because that value proposition of quality — not just in the classroom but after they leave college and go to graduate school or go on to fabulous careers — speaks in advance to how well we do. NU: Where is “Differentiate or Decline” available for purchase? Andrews: It is available for purchase on Amazon.com. NU: Have you published any other works? Andrews: On my own, I have published (journal articles) about how to market to new students, especially in this new era. Once the clock turned over from the ’90s to the 2000s, there is a perceptual shift about it being a new century. And believe it or not, I’ve also published a little bit of personal finance — about the responsibilities of a faith-based institution to teach some of the fundamentals of personal finance because we really don’t get it anywhere else in our society. NU: Are you working on any other publications currently? Do you plan to continue writing and publishing books in the future? Andrews: Yes, it became clear to me during the writing of this book that a second edition would be needed. 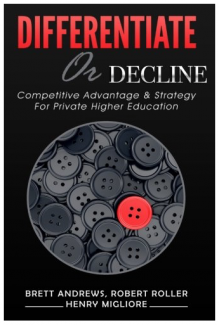 While this book speaks to the grand strategy of a university, many small universities are struggling daily to balance their budget and remain solvent on a day-to-day basis. I intend to add several chapters to the end of this book that speaks to the short-term moves that can be made immediately to bring efficiencies to the campus, thus saving thousands of dollars annually that can be reinvested in other strategic growth areas.